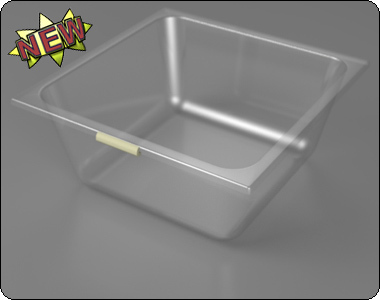 20.5" x 20.5" x 9"D Clear-View Tub with a handle for easy gripping. Weight: 4 lbs. Ships via UPS unless ordered with a table. Call for shipping costs. Call us at 800-252-0276 to order! 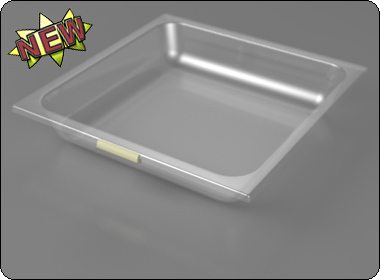 20.5" x 20.5" x 4"D Clear Drip Pan with a handle for easy gripping. Our new caster spacers will let you raise your unit by 1” increments to make the table height exactly where it needs to be for YOU. 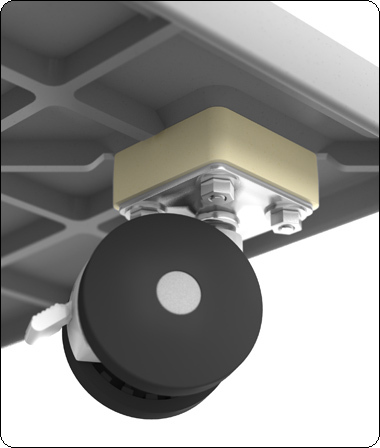 Secures between the bottom panel and the castor plate easily with longer bolts for a solid attachment. 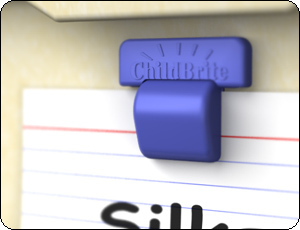 Order a set of 4 to add to your existing Sew-Brite units or specify your desired table height when ordering and we will attach them for you. Weight: 1 lbs. Ships via UPS unless ordered with a table. Call for shipping costs. Clip-on caddie with attachment rail fastens to the side of cutting table (hardware included), providing a handy, off-the-surface recepticle for shears, rulers, cutters, pin cushions, etc. Ten cups with lids are perfect for buttons, snaps or other small notions and can be left in the trays or moved to a drawer. Weight: 5 lbs. Ships via UPS unless ordered with a table. Call for shipping costs. 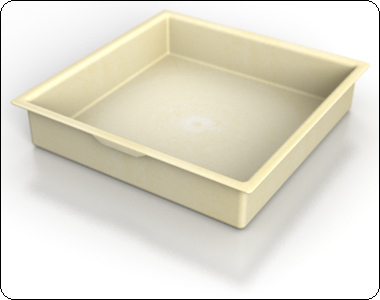 Made of strong and smooth white resins, this lid fits perfectly on top of any drawer, providing a solid surface usable as a shelf and provides dust protection for drawer contents. When the lid is in place the drawer cannot be opened, creating a safety lock mechanism, perfect for households with small children. Keep your sharp objects inaccessible to little hands. Lid can also be used as a portable cutting surface. Weight: 8 lbs. Ships UPS when ordered separately. 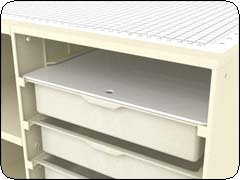 Adjustable dividers let you compartmentize small items within the drawer. Think needles, bindings, pencils, rotary cutters, etc. Set of 10 pieces gives great flexbility in sizing your spaces. Weight: 3 lbs. Ships vie UPS when order separately. Our Sew-Brite cutting mats are constructed of a durable material that is thicker than other mats, giving them longer life when using a rotary cutter. 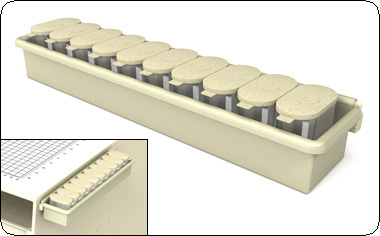 They have 1'' square grids and bias lines that are measured line-to-line in ¼, ½, and 1'' increments to give you greater flexibility in cutting the bias widths you need. Available in two sizes to fit either a 6-unit table or a 3-unit table. If you require a smaller size, purchase the size that is larger than your custom size and we can cut it for you and ship both pieces. 44" x 66" (40" x 58" grid) with bias lines. 7 lbs. 22" x 66" (20" x 58" grid) with bias lines. 4 lbs. Same options as the 67017 but with a 22" wide shelf as used in our new "Sew ‘n Serge Station". Let your imagination fly with this one, order as many as you need for the combination you desire. 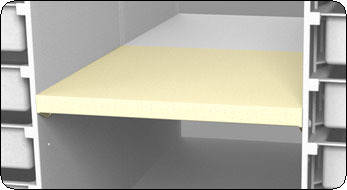 Use six for wide, all-the-way-through shelves, extending your table length to 88" (sorry, no mat for that size) or add another set and create a truly mega cutting table 110" long (again, no mat that size but you could order an additional mat and we would cut it to 44" to fill in the extra space). Or replace just the center unit (top and bottom, no middle shelf) on one side of your table for a sit-down place without adding to the length of your table. Use the displaced drawer unit somewhere else for storage. Shelves priced separately, order quantity needed. 10lbs. Ships UPS. Use as a middle shelf to create a sit-down space. 22"W x 11"D.
Stick this handy hanger up anywhere. Available with an adhesive back. Use on each mega tray front to hold a card label to identify contents at a glance. Push card up to insert, slide sideways to remove. 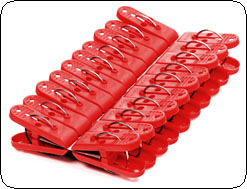 You will find a multitude of uses for this roomy clip. Hold patterns & instructions together, convert a plain hanger to a skirt (or fabric) hanger. Secure bundles of ribbon or trims. ©2019 Manta-Ray, Inc. All Rights Reserved.